Oh baby! I’m finally getting my appetite back now that I’m in my second trimester. My interest in cooking, let alone something new and untried, dropped dramatically during my first trimester. I stuck to things that I hoped my body would tolerate, safe food! But finally, I’m back in the kitchen, trying new things and throwing together recipes. This one was from The Kitchen Sink and I made it work even for my pregnancy restrictions (just heated the deli meat up first before putting it on my sandwich to grill). Squeeze the cabbage mixture to remove any excess liquid and return to the bowl. Toss the cabbage with 2 Tbs. of the yogurt mixture. Spread the remaining yogurt mixture on one side of each slice of the bread. 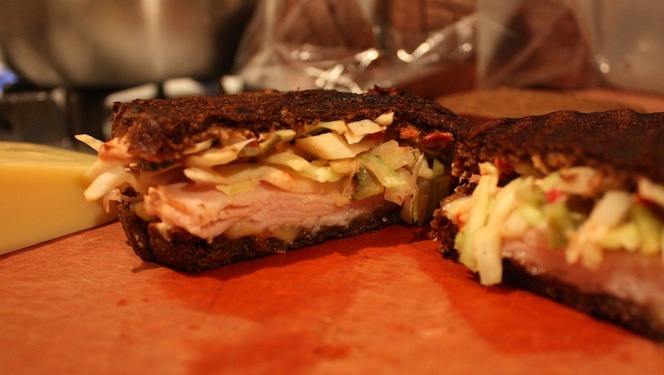 Assemble the sandwiches, layering the turkey, cabbage, and cheese over 4 slices of the bread and topping with the other 4 slices. Spread the outsides of the sandwiches with the butter. 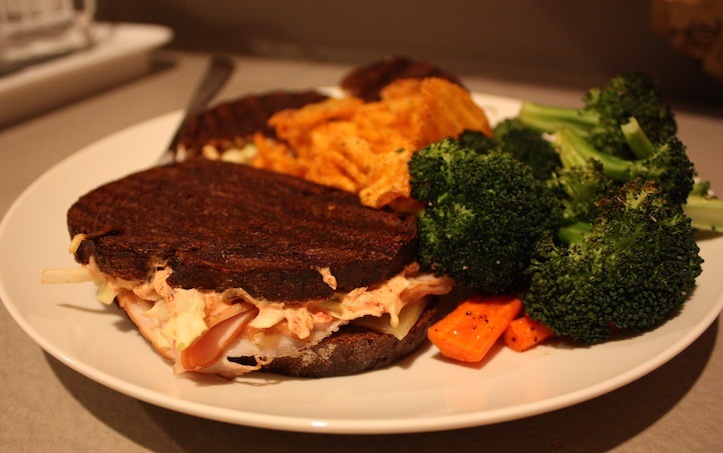 Notes: A lovely and lighter version of the classic Rueben, which Chris and I both love. Shoot, now I’m hungry! That sounds amazing – and I’m glad you’re feeling better!